The third and final faction to be introduced is the only one which survived the events of the first campaign: The Grande République. The flag may change however the title and faction will largely remain the same as it will be transitioning into the second campaign largely as the same entity as in the first. Lore The Grande République stands as master over all. In all her might, she stands uncontested as the primary military power having suffered only one defeat in her long history of warfare. The Grande République views the Revolution as the ultimate goal of any society, and rather than viewing itself as an example of a Revolutionary utopia it assumes the role of destroyer rather than reformer; the old world and the injustices therein will refuse to die and thus shall be put to the swords. Enemies of the Revolution and enemies of the Grande République go hand in hand, as the Republic spreads the ideas of the revolution not by propaganda or public dissent but by sheer force. Her armies are prestigious and well adorned with medals and eagles to commemorate past victories, her banners denote an aura of apparent invincibility. Having brought the Rossiyskiy Soyuz to its knees in one fell swoop and battled the Crown Colonies into a corner, the Grande République does not need to search long for an example of her glory and superiority. However, the very core of the Grande République has come under attack. Not by any army or natural disaster, but by an enemy unseen by all; hubris. The Grande République is structured almost entirely around its impressive military. Political power and military prowess go hand in hand, those who prove themselves on the battlefield find themselves in much grander positions of power and influence. The wars of the past paved the way for many self-made men to assume control of key positions, but the final defeat at the hands of the Crown Colonies left a sour taste in their mouths and a stubborn stain on the records of the Republican forces. Regardless, the prestige of the Grande République remained strong. Massive amounts of new land had fallen under her control and before long the Republican forces could turn their eyes to whatever remained of the Crown Colonies, in the form of the Crown Commonwealth. Then, disaster struck. Several territories-both native to the Grande République and recently conquered-have committed an act of treason so terrible that it threatens to tear the Republic asunder. The great hordes of uninformed tyrants wish to reject the rule of the Grande République and the ideas of the Revolution. They claim to fight for their liberty, but such a thing may come at the cost of a return to the old world. It becomes clear that with the rising power of the Crown Commonwealth and the defiant attitude of the Confederate Rabble that the Grande République much once more take up arms to restore her rightful place as overlord of all lands. Description A fan favourite from the first campaign and arguably undisputed victors, the Grande République returns as a formidable giant facing a serious crisis. The faction will be largely similar to the last campaign, it will see some changes potentially to units and to lore. The campaign of the Grande République can be compared to that of the Crown Commonwealth (our first faction, replacing the Crown Colonies) in the sense that the ultimate aim is arguably to restore something which has been lost. However, in the case of the Republic it is pride and undisputed total rule that has been taken from them, as opposed to land. 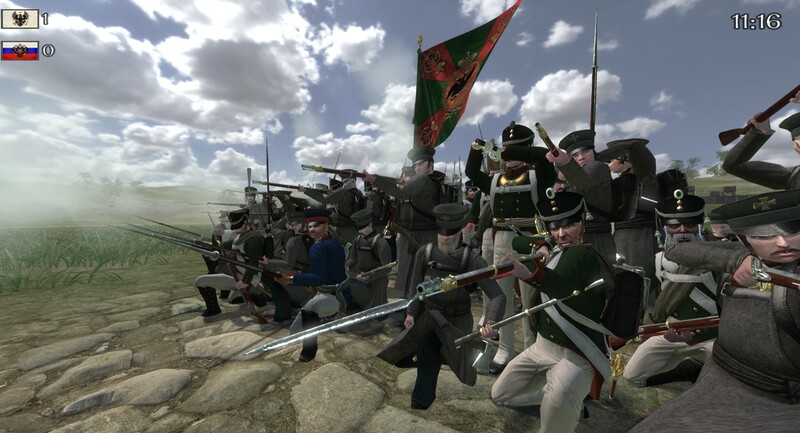 The Grande République's campaign will be about bringing the swift end of the rebellion, a restoration of her rule over key lands and a final defeat of the Crown Commonwealth who defied the Grande République a clean win last time by beating them in the final battle of the previous campaign. If you want a campaign of prestige, assumed supremacy and rebellion crushing then check out the Grande République! Scuba-diving on NRP came with our medic scripts. Not the "NW Update" medic scripts, the ones we got about a year beforehand. Essentially, flagbearers and rifle sergeants spawned with a butter knife. You could hit people to heal them. The idea was that two "medics" could go under water and hit one another with their knives every few seconds to perpetually stay healed underwater. It allowed players to indefinitely remain beneath the surface. Introducing our second Faction of the new NRP Campaign; The Confederation of Liberated Lands Known otherwise simply as The Confederacy, this faction is a totally new addition to the roster. As always, the name+flag+certain lore elements of the faction may be subject to some change as we develop the Campaign further! Lore After the Grande République conquered large swathes of southern territory previously occupied by the now-dead Rossiyskiy Soyuz, a large number of foreign soldiers and politicians became involved in various Republican circles. While previously all loyal Republican citizens were bred from birth to live and die for their capital and the spread of their ideas, this new influx of citizens were not "enlightened" by the ways of the Grande République. Soon several separate Legions and Regiments consisting entirely of these conquered peoples formed huge sections of the Grande République's armed forces, and many territories of the Grande République itself were governed and populated by folk who all shared one common trait; their lands had been annexed by the Republican forces. As the years went by the Grande République grew more and more complacent, and with this attitude came negligence of many territories not governed by veterans of the previous war. A divide began to spread across the Republic, with more demands for increased autonomy flooding the Capital only to be met with a flat refusal. When rioting broke out after a group of Republican soldiers became involved in a dispute between a corrupt landowner and his tenants, a group of military veterans gathered their militia and arrested the Republican soldiers. The Capital erupted with outrage at this apparent act of "treachery" and demanded the immediate release of the prisoners and surrendering of the arms by the veterans. Across the Grande République several lords and commanders declared support for the Veterans, whilst others continued to demand the release of the prisoners. Tensions reached boiling point when an army of the Grande République was went to forcefully subdue to town in which the prisoners were kept, resulting in a battle between the local militias and the Republican forces. Much to the shock and disdain of the Republican commanders, the Militias were decisively victorious. It was then that a secret meeting of veterans and politicians in the nearby woods came to light, an event which became known as "The Monster Meeting" where a large amount of landlords and military commanders declared that they would co-operate with one another to resist the tyranny of the Grande République. Over time as the dispute escalated into a full blown rebellion, the lands owned by the rebels came to be named The Confederation of Liberated Lands. Description The Confederacy is a totally new addition to our faction list, however it has some ties to the RU of the previous campaign. It represents a union of various people conquered at some point by the Grande République who have now declared independence. This is not a simple "rebellion" faction; the legitimacy required for nationhood has been gained and only the high command of the Grande République (more on the evolved GR in a later update) view them as a simple "rebellion." The Confederacy will focus much on ideas of liberty/self reliance but will have many eastern-european themed units; we wanted to mix up some common themes to create something memorable. It is not a Russian faction but rather a group of different nationalities and units all pooled from conquered lands. While other factions may seem prestigious, noble or associated with power and might, the Confederacy appeals more to an everyman/militia sort of campaign playing as the apparent "underdog", however do not make the mistake of viewing them as less powerful than the other 2 factions. Playing for the Confederacy will largely be about defending ones newfound freedom and attempting to liberate more lands from autocratic rulers. Expect some pretty funky special units, too! Many of you have been playing the server for several years, and I think it'd be neat to share memories/pictures/whatever that will let us all remember the good times had on NRP. Personally I always fondly remember the initial addition of grenades and how absolutely dreadful they were before the explosion timer was added. Nothing like having 2 massive AOE explode-on-impact weapons to huck at crowds! In this update I'll outline some changes to how Faction Leadership in the Campaign will work. Previously, all of the wargames aspects (army movement, map control, aka everything not in the battle) was controlled by 1 individual as the Leader of their faction. I felt this needed improvement for two main reasons: 1. If said person is unavailable OR ineffective, it brings their faction to a grinding halt. 2. All the mechanics and campaign tactics which took so much work to plan are only really experienced first-hand by one person. Therefore, I'm reworking the command system into a simple Chain of Command. Currently, the template is as follows: 1. Faction Leader Same as before, this is the overall leader and representative of the Faction. They are in charge and will have the most influence in the running of their Faction during the campaign. 2. Second in Command Essentially there to fill in when the Leader can't be present or is otherwise occupied. When the leader is present they will likely still be quite influential in his decisions. 3. Generals The Generals (up to 3 maximum) can take on some devolved duties from the Leader or Second in Command to ease the amount of work dumped on them. An example of this can be leadership of a particular army which they can command each turn, etc. The Chain of Command allows each Faction to not have just one person running things, but rather a team of people running things. It will also improve immersion and lore for the campaign as we can be more personal with who commands what. It also grants players more incentive to move up the ranks of their Faction in order to potentially enter one of the multiple leadership roles. All changes applied to the Campaign are either simple improvements or streamlines of previous systems to ease the level of stress/paperwork for our staff to undergo for each battle. First reveal of the Campaign will be the Faction which will replace the Crown Colonies! Here we have our first attempt at creating a flag to represent the new faction. In this update I'll be referring to the new faction as the "Crown Commonwealth" (CC) however this name may be subject to change. When the Faction is fully fleshed out there will be more lore and information made available. This is just a placeholder name for the time being until our friendly lore-goblins have come up with some concrete stuff! Lore The Crown Colonies saw many defeats at the hands of the seemingly unstoppable Republican forces of the Grande République. The unique Governmental Structure of the Crown Colonies proved popular in times of peace, but ultimately contributed to the downfall of the faction. However, just as it seemed all hope was lost, a group of veteran Crown Commanders rallied a Colonial Army and lead them to victory against the Grande République, inflicting the first serious blow to their campaign. While the victory was not enough to turn the tide of the war, it was enough to secure a hastily drawn up peace deal to allow the two exhausted nations to recover from seemingly endless conflict. The peace deal was heavily in favour of the Grande République-only natural due to their much stronger position at the time-with much land conceded to them and their newfound vassal in the Rossiyskiy Soyuz. It was only natural that the leader who signed the peace treaty stood aside after doing so, with no man able to bear the burden of rule after doing so. However, a new problem presented itself; who would now rule the Crown Colonies? The war left many electors dead or missing, and few wished to take the reins of such a shattered nation. Many settlements once more began to go dark, as the divisions within the various townships of the Crown Colonies started to solidify. Crisis arrived when one of the larger cities attempted to officially "secede" and fend for themselves rather than contribute to what they believed was a doomed nation. It was only when a veteran of the final battle against the Grande République rode an army into the town and arrested the Mayor for treason that hope returned to the eyes of those loyal to the Crown. He quickly rose in popularity, with much support from his peers as he began to rebuild the war-torn lands and unite a divided people. The previously somewhat overlooked German and Dutch population of the Crown Colonies were overjoyed at acts which saw them granted laws protecting their language, culture and identity within this new nation, and soon they too were given official Regiments and Companies within the army. Many mused that it were as though the Grand Veteran had reached into the heart of these people and pulled from it a Prussian Army. Before long, many saw him as the embodiment of their nation; strong, resilient and unwavering in the face of seemingly hopeless odds. With the Crown Colonies and the politics therein quickly becoming a battered memory, a set of unprecedented reforms lead to an event which would change the face of the nation forever; the Crowning of the Colonial Soldier. Description We wanted to make the Crown Colonies into something a little more extreme-or rather a little more exciting. The "Crown Commonwealth" will be a Faction out for revenge, seeking to regain lost lands and with them a sense of pride. They will be themed much more toward Monarchs and Royalty than before, with the High Command taking titles denoting nobility and prestige. The units will mostly be British-themed, however it will also have several Prussian-inspired units to represent not only the German/Dutch-English population of the Colonies but also some potential mercenaries which may have arrived to help. This faction is for you if you'd like to not only restore the honour of your allies, but also strike back at the heart of the Grande République and her delusions of invincibility. Due to the overwhelming success of the first NRP Campaign, work on the second has been underway for some time now. Much of the groundwork which held us back before is already in place, the main development goals for the second campaign are: -Development of the 3 Major Factions of the Campaign -Development of an improved Campaign Map -Retextures/modding We will have people working on all major development points, however one other main thing we'll be working on is streamlining the experience while also expanding the number of people who can feel involved both on and off the battlefield. With each major update we'll put the information here! Declined. Came and went too much from Admin but realistically due to recent events and the vulnerability of our rules to change or scrutiny I don't think you'd be suited to Comstaff right now. Good to see you back regardless, though.